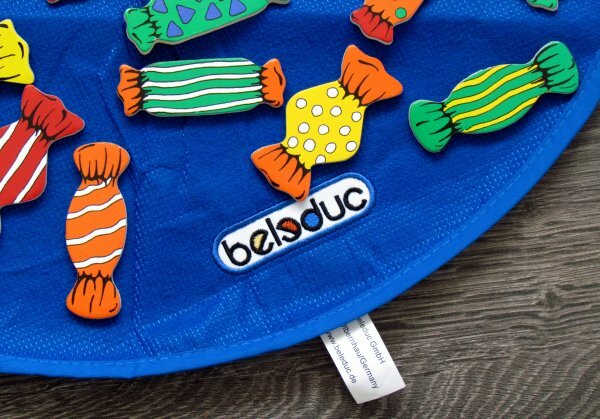 Just a moment before, this bag was full of sweets. Now, I am looking at the empty polythene and burst into tears. “You did that,“ I turn my rage on little sister. I watch as her tears start to roll down on her cheeks. Suddenly, I am confounded. My fault for breaking the bag is exactly the same. 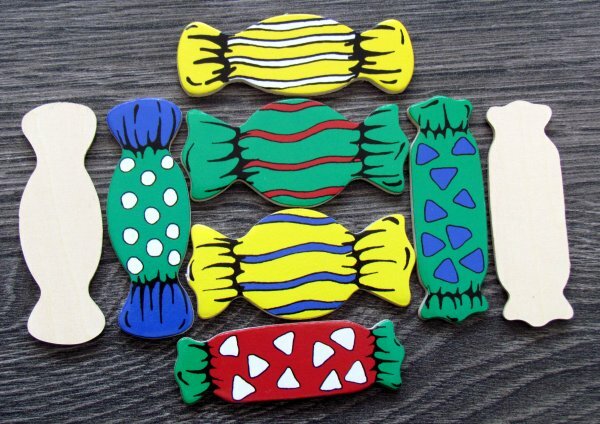 I look again on the ground, where rolled out sweets lie on the carpet and start picking them up. But you can not always be collecting goodies only by yourself. Once the sweettooth notice it, they start to crave the candy also and then, you have to be quick and fight for it. And fight like this is started in board game Candy from Beleduc, illustrated by Simone Kalz. Inconspicuous and small blue box has already on its packaging boasts of pictures of tangled sweets. And they really can be found inside, but not putting them in your mouth is better this time. Why? 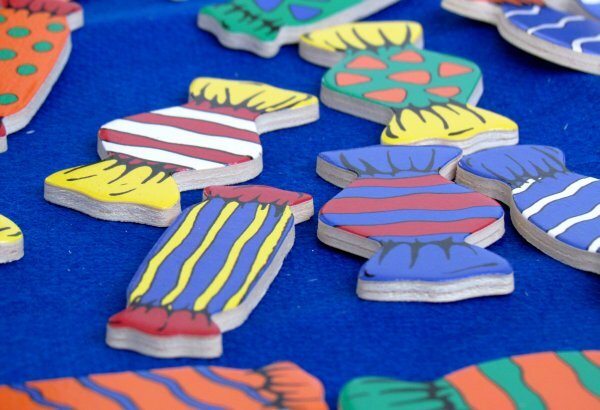 They are made of wood and there is an impressive total of 41 pieces inside. 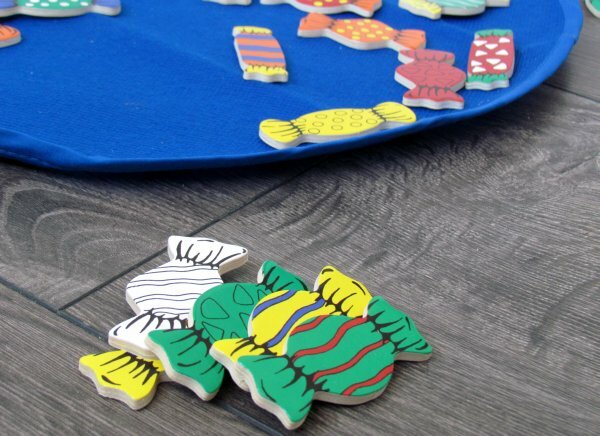 They carry different combinations of colors and stripes, so players have it more difficult to identificaty them at a glance. Inside the box, its not only about them. 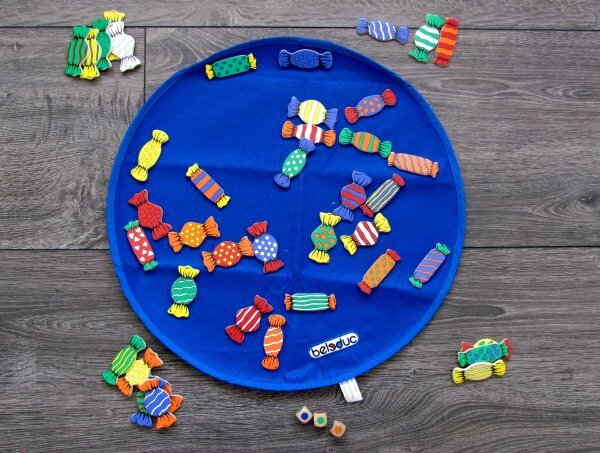 Players can also look forward to an unusual gift in the form of round cloth, serving as a game board. Even this piece has a blue color. 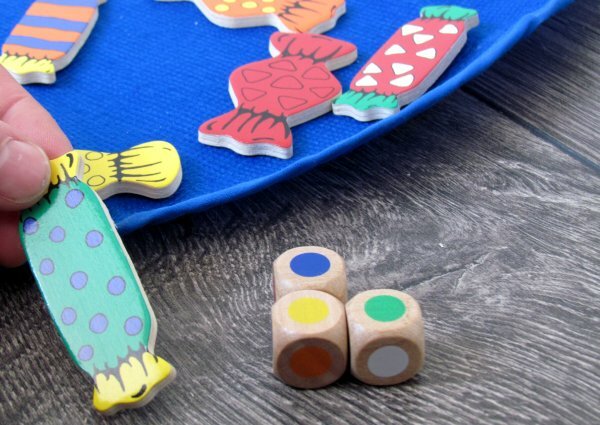 With wooden candy and bag shares bottom of the box also a trio of dice, that are wearing dots in all thinkable colors. 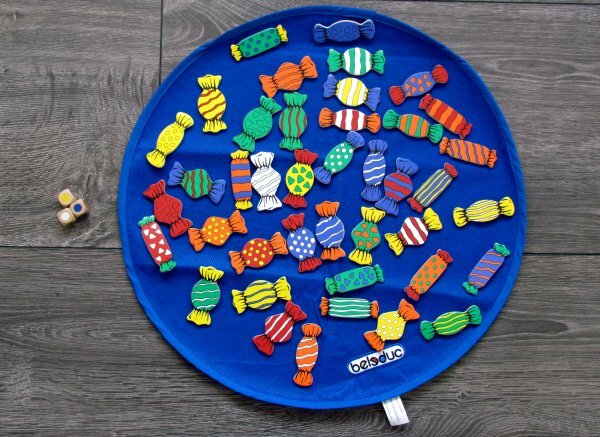 At the beginning of the game, players spread all candies over the board, so they have all visible color (one side only). Starting player gets three dice, rolls them and until they stop, attention of all players is directed at them. 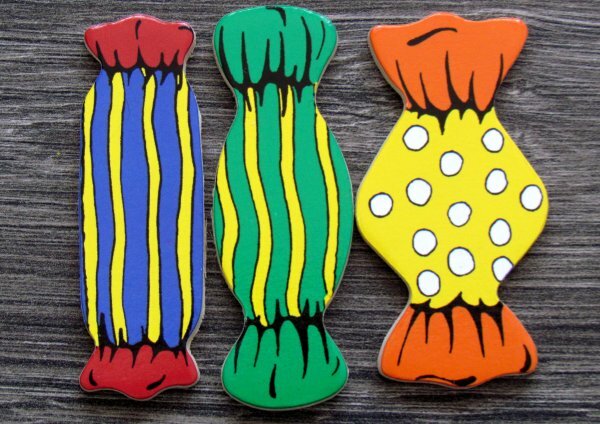 Trinity dots effectively determines combination, which should players look quickly among lying sweets. Who does it the fastest, can taking this piece for himself and reroll the dice. New set of dots indicates a different combination of colors, which players must search again. 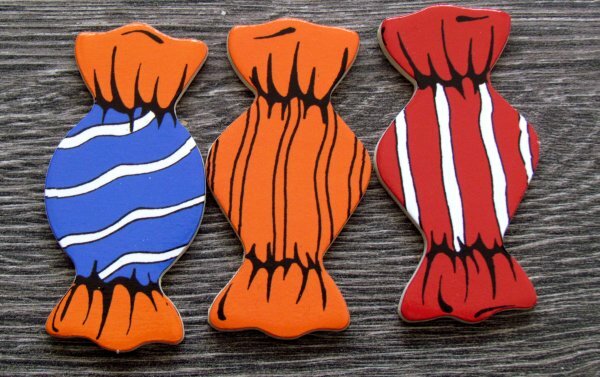 Individual pieces of candy consist of one, two and three colors with different designs, so search for them is not easy. 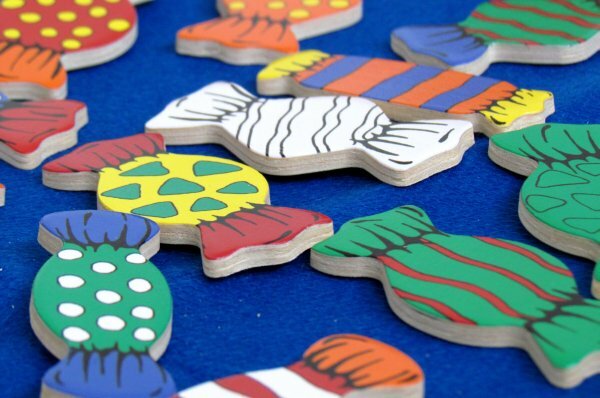 Game ends, when one of player earns a specified number of sweets. Candy is a fast action game for children (together with their parents), who will appreciate the quality and above all nice wooden processing. 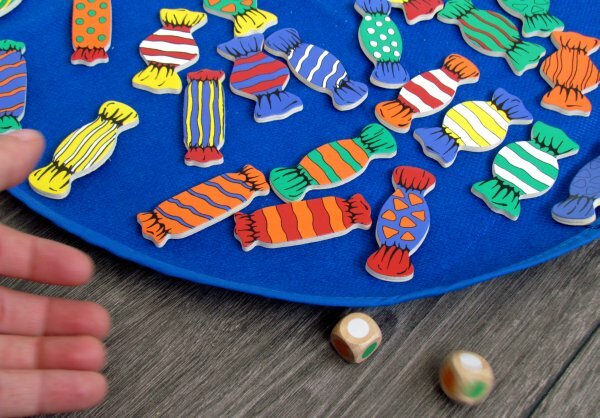 Pieces of sweets are very well handled, are easily picked up and it thus all really depends on the speed, at which players are able to discover right combination of colors. 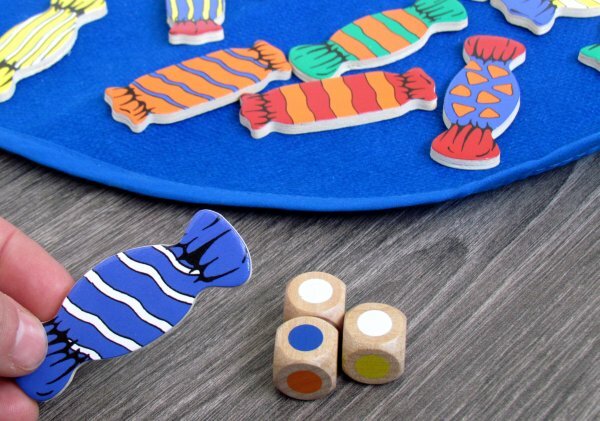 But as the stones disappear from the offer, it also increases chance, that some colorful dots will no longer have a representative on the table. And thanks to these extra rolls and futile (= longer) search for candy, game can stretch a bit towards the end. Therefore it is better to be satisfied with other variations, that are offered in the rules. We like option number 2 the best. 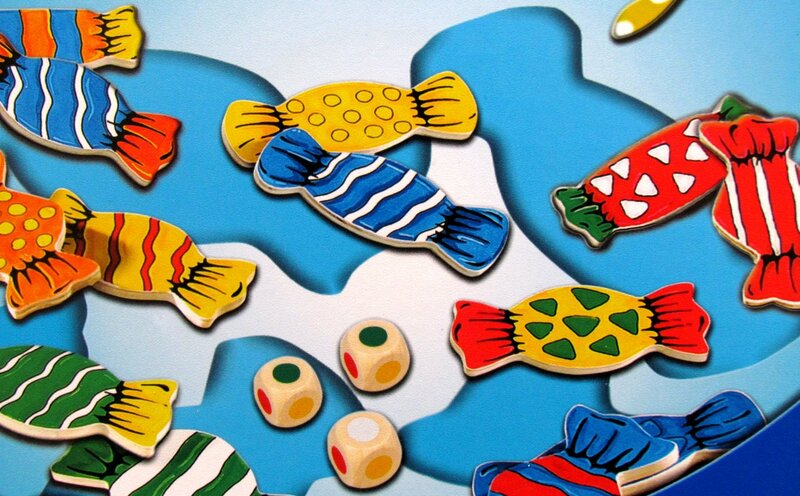 All candies remain in their positions and by finding them, players only score points. Those must be wrote down into some notebook. Each round can then guarantee certainty, that stone is really there. Moreover, in case of same color combinations, game then trains not only speed and concentration, but also memory. 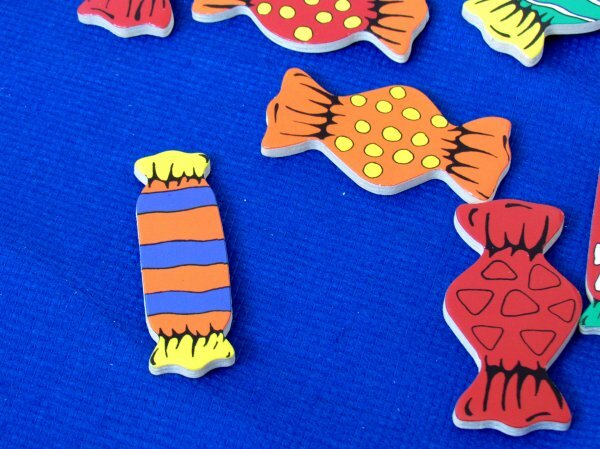 Then there is a third variant, in which candy is distributed among players themselves. 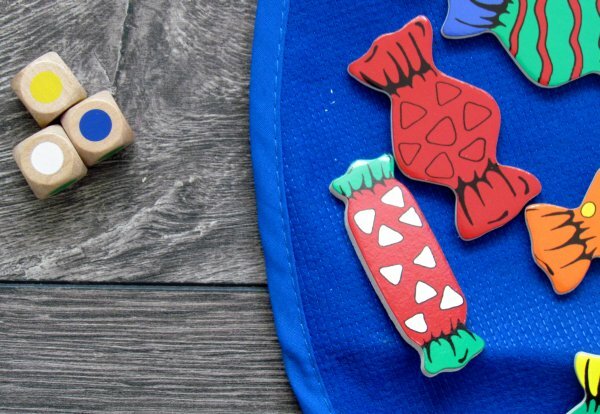 This time, they are trying to get rid of sweets in their possession, so everyone rolls the dice only for himself. This variant is weakest, because more dice rolls mean a longer game. 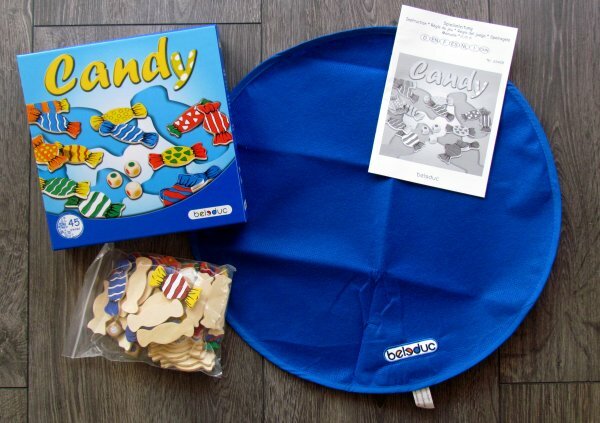 Additionally, game is much more random, because each player must roll his combination to eat one of his candy. In our selected variant game makes fun (as in the original, basic). Matches are flowing well, because hunt for candy is always attended by everyone. From two to eight players can compete, and without any problems, because game play works for all numbers alike. 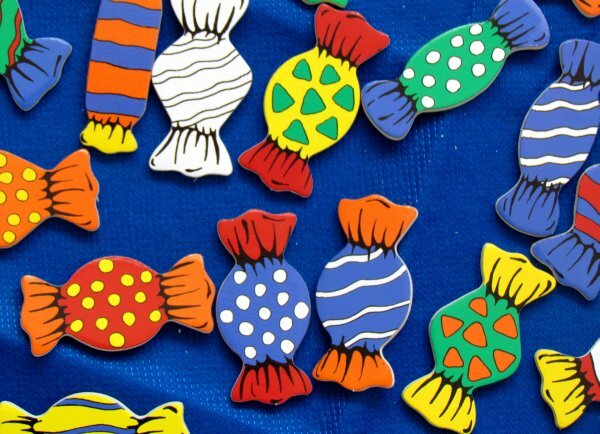 Candy is other representative of children games, that focus on speed and reflexes. It trains children´s ability to concentrate and this is very important, because this game can be joined by competition from fourth year of age. Great impact on impression has high-quality design and simple rules. From time to time, it can be certainly enjoyed even by a parent. Candy is sweet and fun, although resulting game does not bring anything new to the market.